Tall, robust and beautiful with an extraordinary voice and virtuoso accordion playing technique, a new star of huge proportions is born. 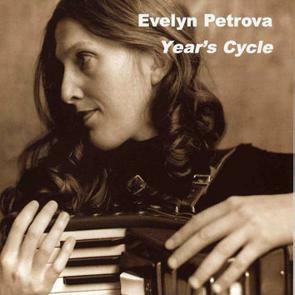 Evelyn Petrova's raw, rootsy, sometimes almost vulgar primitivism blends seamlessly with the free flowing ease of a jazz improviser and the precision of a classical virtuoso. Each of the twelve pieces in "Year's Cycle" represents one month of the year and is based on the traditional moods of different regions of Russia. After hearing this recording, promoters will be fighting to get her to perform at their festivals. Total time: 59'01.